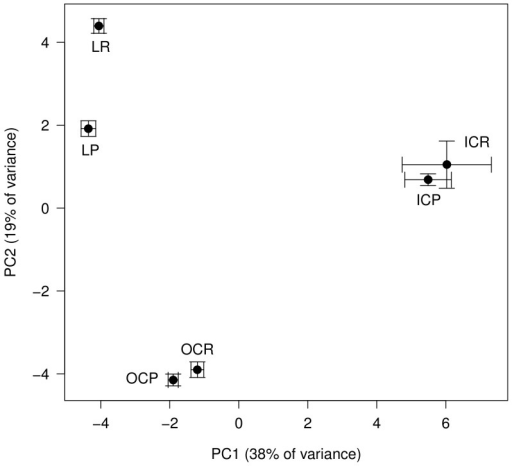 Often in ecological research, we are interested not only in comparing univariate descriptors of communities, like diversity (such as in my previous post), but also in how the constituent species — or the composition — changes from one community to the next. One common tool to do this is non-metric multidimensional scaling, or NMDS. The goal of NMDS is to collapse information from multiple dimensions (e.g, from multiple communities, sites, etc.) into just a few, so that they can be visualized and interpreted. Unlike other ordination techniques that rely on (primarily Euclidean) distances, such as Principal Coordinates Analysis, NMDS uses rank orders, and thus is an extremely flexible technique that can accommodate a variety of different kinds of data. Below is a bit of code I wrote to illustrate the concepts behind of NMDS, and to provide a practical example to highlight some R functions that I find particularly useful. Most of the background information and tips come from the excellent manual for the software PRIMER (v6) by Clark and Warwick. First, let’s lay some groundwork. Consider a single axis representing the abundance of a single species. 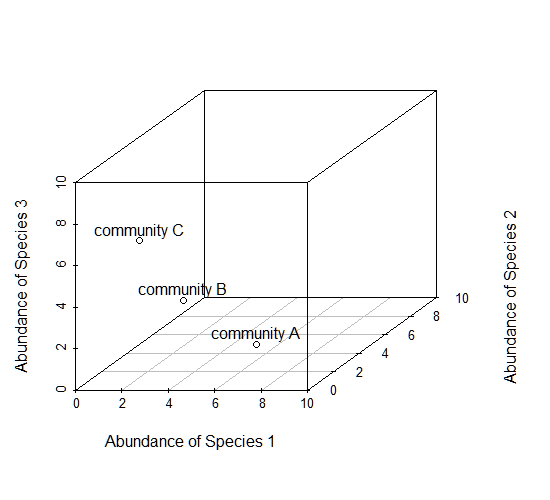 Along this axis, we can plot the communities in which this species appears, based on its abundance within each. Now consider a second axis of abundance, representing another species. 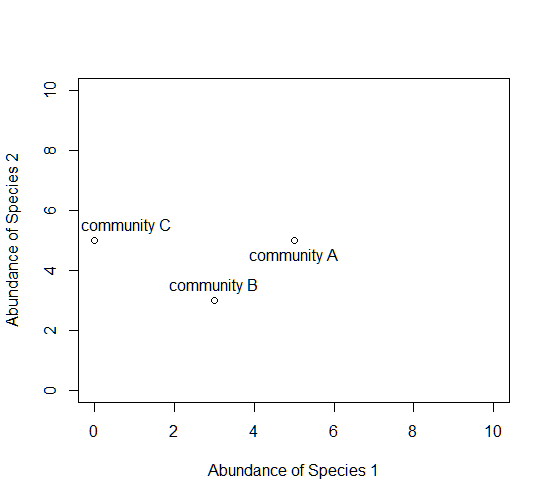 We can now plot each community along the two axes (Species 1 and Species 2). Now consider a third axis of abundance representing yet another species. Keep going, and imagine as many axes as there are species in these communities. The goal of NMDS is to represent the original position of communities in multidimensional space as accurately as possible using a reduced number of dimensions that can be easily plotted and visualized (and to spare your thinker). Define the original positions of communities in multidimensional space. Specify the number of reduced dimensions (typically 2). Construct an initial configuration of the samples in 2-dimensions. Regress distances in this initial configuration against the observed (measured) distances. Determine the stress, or the disagreement between 2-D configuration and predicted values from the regression. If the 2-D configuration perfectly preserves the original rank orders, then a plot of one against the other must be monotonically increasing. The extent to which the points on the 2-D configuration differ from this monotonically increasing line determines the degree of stress. This relationship is often visualized in what is called a Shepard plot. 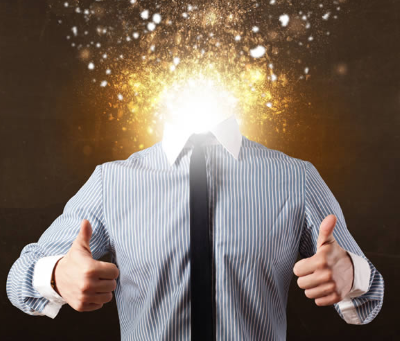 If stress is high, reposition the points in 2 dimensions in the direction of decreasing stress, and repeat until stress is below some threshold. **A good rule of thumb: stress < 0.05 provides an excellent representation in reduced dimensions, < 0.1 is great, < 0.2 is good/ok, and stress < 0.3 provides a poor representation. ** To reiterate: high stress is bad, low stress is good! Additional note: The final configuration may differ depending on the initial configuration (which is often random), and the number of iterations, so it is advisable to run the NMDS multiple times and compare the interpretation from the lowest stress solutions. To begin, NMDS requires a distance matrix, or a matrix of dissimilarities. Raw Euclidean distances are not ideal for this purpose: they’re sensitive to total abundances, so may treat sites with a similar number of species as more similar, even though the identities of the species are different. They’re also sensitive to species absences, so may treat sites with the same number of absent species as more similar. It is invariant to changes in units. Let’s do it in R! To run the NMDS, we will use the function metaMDS from the vegan package. The function requires only a community-by-species matrix (which we will create randomly). You should see each iteration of the NMDS until a solution is reached (i.e., stress was minimized after some number of reconfigurations of the points in 2 dimensions). You can increase the number of default iterations using the argument trymax=. which may help alleviate issues of non-convergence. If high stress is your problem, increasing the number of dimensions to k=3 might also help. You’ll see that metaMDS has automatically applied a square root transformation and calculated the Bray-Curtis distances for our community-by-site matrix. Let’s examine a Shepard plot, which shows scatter around the regression between the interpoint distances in the final configuration (i.e., the distances between each pair of communities) against their original dissimilarities. Large scatter around the line suggests that original dissimilarities are not well preserved in the reduced number of dimensions. Looks pretty good in this case. Now we can plot the NMDS. The plot shows us both the communities (“sites”, open circles) and species (red crosses), but we don’t know which circle corresponds to which site, and which species corresponds to which cross. We can use the function ordiplot and orditorp to add text to the plot in place of points to make some sense of this rather non-intuitive mess. That’s it! There’s a few more tips and tricks I want to demonstrate. Let’s suppose that communities 1-5 had some treatment applied, and communities 6-10 a different treatment. We can draw convex hulls connecting the vertices of the points made by these communities on the plot. I find this an intuitive way to understand how communities and species cluster based on treatments. One can also plot “spider graphs” using the function orderspider, ellipses using the function ordiellipse, or a minimum spanning tree (MST) using ordicluster which connects similar communities (useful to see if treatments are effective in controlling community structure). You could also color the convex hulls by treatment. You could even do this for other continuous variables, such as temperature. # rather their RANK ORDER! # iterations using the argument "trymax=##"
# (red crosses), but we  don't know which are which! I am phd student at Tehran university, Iran. I need paper fpr definition of N-MDS. Guide me, please. Any statistical textbook will do! the text are closed to each other, and even some are covered by each other, is there any good way to solve this problem? Try the air = argument in orditorp! I change the air=argument, then below is the result. It doesn’t work. Amount of empty space between text labels. Values <1 allow overlapping text. Thanks, I would try to set priority parameter. Is there any difference between 2 D and 3D in NMDS .in Most of the biology papers NMDS with 2Dimension is used..Before going to NMDS K-MEAN analysis is need or not? 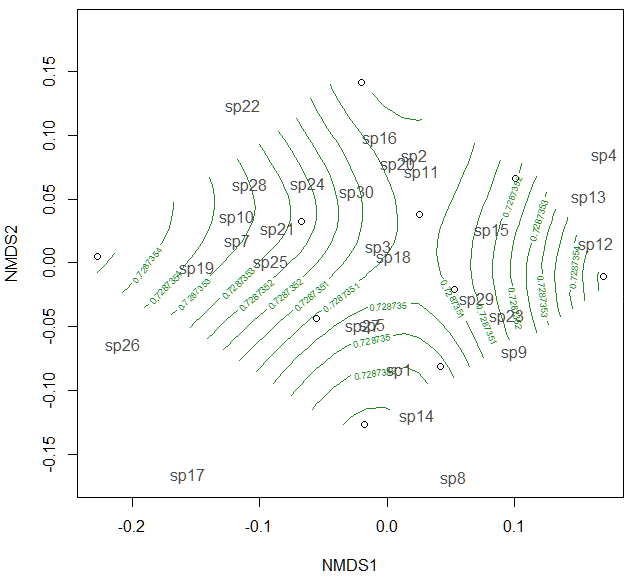 Is there a script command to get the correlations of the species data with the first and second NMDS axes? I’m running metaMDS() and specifying k=3. Is there a way to plot three dimensions in three 2D graphs? E.g. one graph of NMDS1 vs. NMDS2, one graph of NMDS1 vs. NMDS3, and one graph of NMDS2 vs. NMDS3. I have been trying to find a clear, simple explanation that goes through taking an ecological dataset through the process of nMDS graphing in R and your post has been so incredibly helpful! Thank you for putting it together and sharing. I’m just wondering, what one should do if they have species of an unknown group in their data set. Would I be able to use this? For example, I am dealing with a data set of grasshopper species among different communities. All of the grasshoppers were identified to species except for some of a genus that is particularly hard to identify at it’s earliest developmental stages. Thus, those have all been grouped together. Would it be safest to omit them? Should I omit all grasshoppers of all species below the 3rd instar? Or should I leave them as their own “species” group. Or can I even use this at all in this case? Perhaps a very useful item to add to the tutorial would be “where there be dragons with this” aka what people should be aware of in performing NMDS. Its hard to say. Do you want these “unidentified” species to influence your interpretation of differences between communities? In other words, are they unidentified because they are unimportant (e.g., non-target) or because they were too destroyed to confidently ID or because they have difficult taxonomy? In all but the last case, I would probably not include them. Same goes for developmental stages: unless you are specifically interested in how the ontogenological composition changes among sites, then I would leave them out. If you treat them as separate columns the algorithm will view them as wholly independent species, which is not correct. Heh, one day I may revisit the tutorial and add some dragons but alas, too little time! How can I change the treatment commands? I would like to replace them with pH and Conductivity instead. How to create a plot in 3D? Hi there! I found an analyses from a NMDS in a paper, but I can’t find the way to do it. Do you have any idea about the test to get that? thanks!!! Many thanks for the blog. I have a related question. Is any way to calculate any “p-value” from this analysis? Or any measure of “discrimination” among clusters (if any)? Hi Jon, many thanks for the information. It is really superbly helpful. I hope you write a whole book on stats for ecologists some day. I’m using NMDS for the first time. 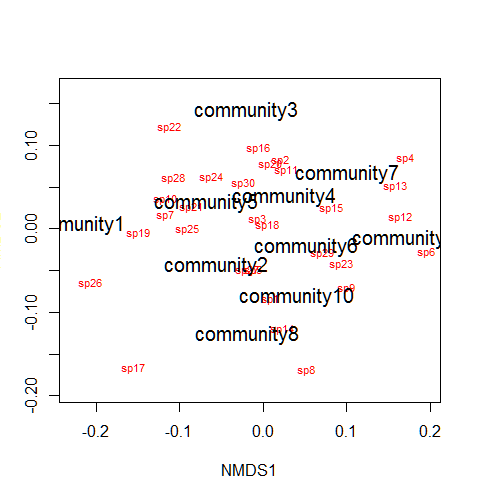 I got a 2D solution with low stress values and I grouped the communities using hierarchical cluster analysis. A more senior ecologist (who champions DCA and always asks during conferences why am I not using it) said the ordination and groupings is wrong due to two groups overlapping on the ordination diagram when colour coded. I know from my knowledge of the sites and through ISA and MRPP that the groupings are sensible and statistically significant (MRPP). It might be a silly question but is overlap in groups in the 2D ordination diagram possible??? Thanks for the kind words! Overlap between the two groups is not only possible but common. Given adequate reproduction in reduced dimensions (i.e., a low stress value) this would indicate that the composition and relative abundances of the communities are not radically different between some data points. If you are looking at, for instance, the community before and after a disturbance, this might actually be a highly desirable result. I wouldn’t worry about a small overlap with statistically significant groupings, as you have here, because as you point out the groups make sense ecologically. The point is that if the results jive with your intuition and observation about the system, that is far more valuable than statistical tests, which are informative but just as often driven by spurious correlations and confounding influence. Thanks for a thorough explanation. I have a morphometric data for 4 species (data set similar to “iris” data in R). I want to see if these morphometric characters can differentiate the species (i.e, species come out as separate clusters). I did make the plot following your code. I can see most of the characters forming a more or less tight cluster and when I map species on them they come out as different clusters. How does species form separate clusters when there are no obvious separate clusters in characters? Also the characters which are inside the polygon, are they important characters for that species? Help me with interpretation. Since the data used in metaMDS is species abundance, I don’t know if it can be applied to morphometric data (quantitative and qualitative). For now I have number-coded qualitative data to make it numeric. Jon: Is there a way to plot (show) some of the ordination ellipses (or polygons) on a 2D graph but not plot (or hide/make transparent) the others? Thanks. Hi Jon, top shelf summary of NMS, thanks :). I have seen that breakdown of stress values and their acceptability before, but not in a formal textbook. Any text I have seen has different values appropriate for say PCORD. Where do you get the breakdown of acceptable stress scores from? Clarke, K. R., and R. M. Warwick. “An approach to statistical analysis and interpretation.” Change in Marine Communities 2 (1994). This is a great tutorial – thanks for taking the time to make it!! Is there a way to measure differences or changes in a site under two different scenarios? For instance, if I plot sites in ordination space using NMDS where there are 12 sites under two scenarios (meaning 24 sites in the analysis), is there a way to determine how much a site changed under the two different scenarios when there is a visible change when plotted using the above code? Thank you for this tutorial! 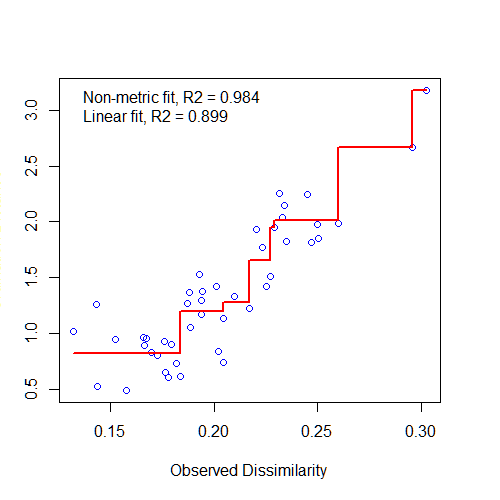 I have a reviewer asking for a pvalue on this clustering…can you advise me on the best test to run to show there is “significant” separation between clusters, even if it is visually obvious? Thank you! Try the function anosim in the vegan package! Hello. Thank u very much for all your useful informations in this blog. I carried out a NMDS on vegetation abundance data to study a succession (different stages) according to reference habitats. I use the first two axes of the NMDS. I also did ANOSIM and ADONIS to see if the groups observed were significantly different, which is the case. Now I m wandering if some of the communities are more or less different from each other. Is there a way to quantify the distances between groups on the NMDS? And is there a quantifiying way to describe the dispersion of plots inside a group? 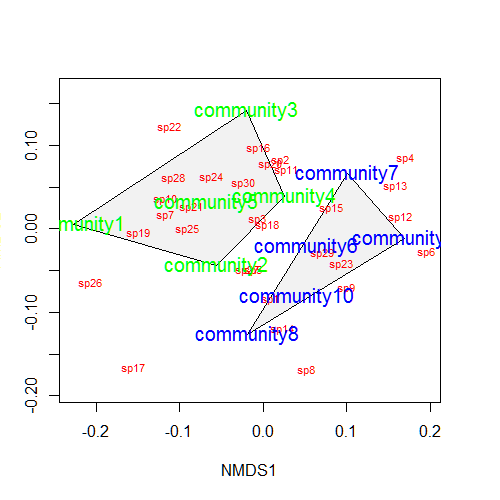 I would like to know how can to calculate the variations of the communities for the first NMDS1 axis and for second NMDS2 axis. I’m just learning R but I have done some NMDS previously in PRIMER, I have a basic question that I hope it won’t take too much of your time, but your explanations are pretty clear. Would you help or guide how to create the Bray-Curtis matrix from existing data (Invertebrate abundance by sites), I’m having problems learning the “matrix” command. Sure thing, check out ?vegan::vegdist. Cheers! I just have a question , how to load already exisiting data set from excel to this package ? 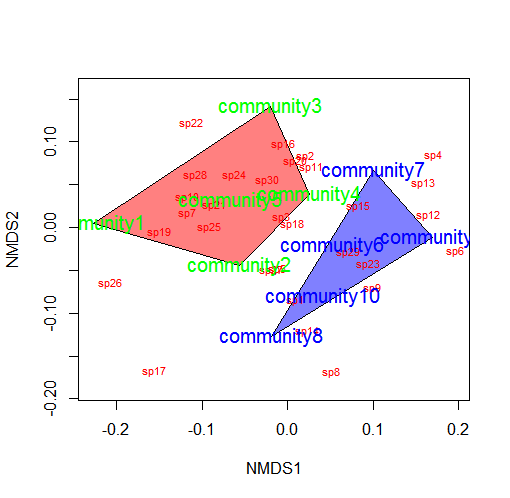 Hi, Jon, thanks for your nice blog which gives a full delineation about NMDS in R, which helps me in solidating the knowledge about its function and uses. Here I would like to ask you a question which has lingered in my mind for a long time: is there anyway to include the variation explained by each axis (1,2 or even 3) like that usually done in PCOA, or PCA just like the post above from BEAU RAPIER ? Wonderful and clear tutorial, thanks for taking the time! And although I can keep on and plot it, I have a nagging feeling that something is not right. I'm using k=2, and tried with different trymax and noshare. Yes, indeed that’s the case. Zeros are actually very common in my type of data, not sure how to deal with that. Would be happy to hear your thoughts on it! I have this same problem (data with lots of zeros and poor to no convergence) so would love to know what methods are available given this? It was my understanding that the Bray-Curtis could cope with zeros relatively well? Thank you for the very clear tutorial to run NMDS. When I run the code, I got the following message.My data have 3 species with 20 variables and each variable has 20 replica but none of the variables have zero value. Though I could plot but I feel that something is wrong in my analysis. Expecting your reply in this matter. Do you have very observations of many or all species? Great tutorial – amazing that the discussion is still lively after so many years. I have a small dataset of 15 sites of three categories and a few dozen species. A 2d nmds reaches a reasonable solution and the plot makes sense (in this case, there’s a fair amount of overlap between the three groups). After some consideration I decided to remove one of the three groups and focus on the difference between the remaining two. However, now with n = 10 the nmds is not successful (stress too low) and the plot gives only two points. Does it make sense to perform the original (three group) nmds and to simply plot only the two relevant groups? If the original results are reliable, not showing the irrelevant group should not be an issue, should it? I agree and decided against it, primarily because reporting it accurately in the methods section would be too awkward. Someone suggested that I use the parallel metric analysis (using vegan::wcmdscale). The results are better and in most cases I get graphs which make sense. I think I’ll stick to it. Hi Jon, thanks for making this tutorial, it is very helpful to someone who is getting started in community ecology on their own. Right now I have an example data set that I’ve been using to run through your examples. I am trying to apply elevation data using ordisurf(), but when I run it I get the following error: “Error in smooth.construct.tp.smooth.spec(object, dk$data, dk$knots) : A term has fewer unique covariate combinations than specified maximum degrees of freedom”. I have one elevation value for each plot. Do you know what might be causing this error? Thank you for this fantastic tutorial! It really helped me to get started with NMDS analysis. I have a question and perhaps you can help me with that. I am working with a set of landscapes (10) from which was measured 17 attributes (classes) and I am primarily interested to know how similar they are and what classes are the most important to describe the ordination space. As I understand, NMDS does not have loadings like in a PCA, so what would be the equivalent measure for variable importance (or variable weight) in an NMDS analysis? Hi, this tutorial is very good. I loved it. I have some issues, hope you can help me on that: When reading my csv file, I don’t have a matrix and the first column is character, the rest integers (first column is site (n rows of site A, n rows of site B, n rows of site C… site H), columns 2:18 are species). If I convert 2:18 as matrix and forget about the site, so I can start the actual nMDS code. But I need the site. So, I forget about the site at the beginning and I tried to generate treatments as if each treatment were the site, so A is treatment1 and site H is treatment8. But when plotting with colors by treatment, treatment5-8 are not included. Please, could you advise me to solve my issue. I prefer to include the site since the very beginning. If you know a way to do so, great. Or, do you know how to solve the issue of the missing 4 treatments? Hi John, I solved the second issue. Following your code of treatments, instead of stating the number of sites I want in a treatment, I was adding the number of rows (row positions) of each site: siteA goes from 1:79, siteB 80:100, and I was using c(rep(“A”,79), rep(“B”,100), …), instead of c(rep(“A”,79), rep(“B”,20), rep(“C”,…). How fun that you try to solve an issue and find another one to solve before solving the firts one. Oh, R, so challenging. I like it! Hi Jon, Thanks for the tut. Wondering how to add specific contour lines for tidal depth continuous gradient; depths are specific and thus can’t be randomly generated. Would love any help! I have a question about overlaying ordinal variable into ordination diagrams. I did a NMDS to extract vegetation gradient, and I am trying to relate the gradient with environmental variables. I have one ordinal environmental variable that is flooding duration. Because I did not know how to measure the flooding duration accurately, so I gave flooding scores, i.e. 1,2,3 in each plot. The question is it is valid to use the envfit function or ordisurf function in vegan to overlay this ordinal variable to ordination diagram? Thank you for this tutorial a fellow lab colleague sent me it and I believe I am on the right track. 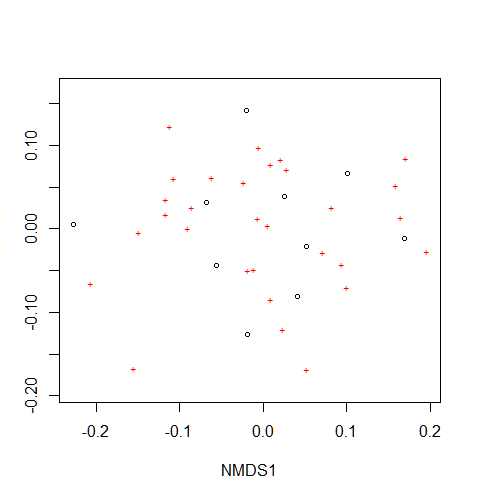 However, maybe you could provide some insight on how I should code or program an NMDS model for my data. Originally I was going to run models for each year. I have a number of lakes that I sampled over a three year period. I extracted gut contents of fish and additionally measured three metrics associated with them. I am hoping to combine these metrics in addition to gut contents of these fish to see how these lakes would compare. Should I be combining all years together or should I be running models for each year separately? If I were to combine all three years, how would I go about specifying each lake and each year separately in my NMDS plot? The initial model I ran did not allow me to leave in the lake labels (I had to change them to numbers instead because they alphabetized codes are not numeric). Once the model was ran I found that certain points were not labeled by species, site or by fish metric. Hi again Jon, I think I am a little confused as to how I would go about assigning my points for my lake sites. I have been trying to leave my sites in my first column of my input table. But then how would I incorporate the different years for each lake into the table as well? For instance would I be assigning my points based on LakexYear, for example A1-2015, B2-2015, A1-2016, B2-2016, etc? Another issue I am seeing is that not all of my points are being plotted and labeled. Any idea what might be causing the problem with the partial datasets? There are no sites with missing values but there are often plots where no organisms were found. To make sure I am understanding, these sites need to be deleted? Correct…they don’t tell you anything about community composition (because there is no community), so no need to include them!